Properties in Fetovaia average 4.6 out of 5 stars. Beautiful and romantic little house! 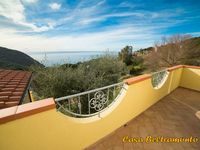 The house is located in a charming village 10 minutes walk to the beach. It has a beautiful garden full of flowers. And not to mention the breath taking view of the bay from the bedroom. In the evening, you can enjoy the amazing sun set with Corsica over the horizon. We had a very romantic time there! This is a perfect getaway! The house has a huge terrace with ocean views and spectacular sunsets. We had very comfortable beds and just what we needed in the kitchen for breakfasts. We suggest backing down the private road and into the parking area. Our big Alfa needed more space than we had for exiting the car port. There are several good places to eat in the village- the Pizzaria and at the hotel. We enjoyed the variations of landscapes on the island and also comparing the cuisine of Elba to other areas of Italy. Everyone we met was friendly and the experience we had there was memorable!